Parents play an important role in their children’s learning and development. At William Penn Foundation, we support efforts to help prepare parents to be their children’s first teacher. This week, we welcomed 200 Philadelphia educators from schools and child care centers for a discussion of best practices for communicating with parents and care givers. We heard from Learning Heroes, a national research organization and parent resource, about how parents feel about their children’s education and about how to talk with parents about their role in students’ learning. We wanted to share a few insights from Learning Heroes here, so read on for a conversation with Bibb Hubbard, founder and president of Learning Heroes, about her work to give parents the tools they need to support their children in reaching academic goals. What inspired you to seek a better understanding of parents and how they view their role in their child’s education? I have seen many inspiring examples of parents helping their children learn, grow, and prepare for whatever lies ahead. I have also seen how the education system often unintentionally works against parents by not understanding their mindsets and perspectives. As a mother who has dedicated my professional life to improving education for all children, I saw this as a barrier that was unacceptable, but not insurmountable. So, I set my sights on listening to the wide range of parents and guardians out there and learning about their experiences as they raise their children to succeed and thrive in today’s complex world. While parents look to report card grades and feedback from their children’s teachers to learn about their child’s performance, they rely on their children’s mood, behavior, and attitude to gauge how successful they are in school. What are some of the key things you learned from doing research with parents? What has most surprised you about parents’ mindsets and what they are looking for from their children’s educators and school leaders? Parents define success beyond academics and are willing to do whatever it takes to help their children be successful. One of the most surprising findings is that 90% of K-8 parents believe their child is at or above grade level in reading and math, despite national and state data that show it is closer to 30% of students performing at that level. While parents look to report card grades and feedback from their children’s teachers to learn about their child’s performance, they rely on their children’s mood, behavior, and attitude to gauge how successful they are in school. The challenge is that many parents don’t always know there is a problem that needs to be addressed. Schools can better serve parents by providing them with a more holistic picture of their children’s achievement, so parents can take the actions necessary to best support their child’s development and growth. Your research shows that parents expect a dialogue with schools about their child’s social, emotional, cognitive and academic skills. What are the best mechanisms for schools to communicate with parents about these skills? Schools and out-of-school settings reinforce the development of life skills in children. Parents want feedback from teachers, but also look to and trust information about the development of life skills from other family members, pediatricians, and experts in the field. Parents don't want their children formally graded on life skills in a classroom setting, nor are they comfortable with creating standards for learning these kinds of skills. Teacher feedback via anecdotal emails, phone calls, and notes on report cards are expected and appreciated, as long as they do not include a formal letter grade. The spirit of “partnering up with the teacher” is what parents expect. To parents, teachers are their “eyes and ears” when it comes to developing life skills in their children. Your research indicates the importance of giving parents actionable tips on how they can support their child’s learning, rather than focusing on data points such as grades or standards. What are some of those tips you’ve heard parents say they appreciate most? While parents are concerned with their child’s academics, the issues they are most concerned about – the ones that keep them up at night – include their child’s happiness and emotional wellbeing, peer pressure, safety, and their child’s ability to cope and manage stress. That’s why we provide parents with access to a variety of resources from trusted partners – resources that correspond with the issues that are top of mind for parents. 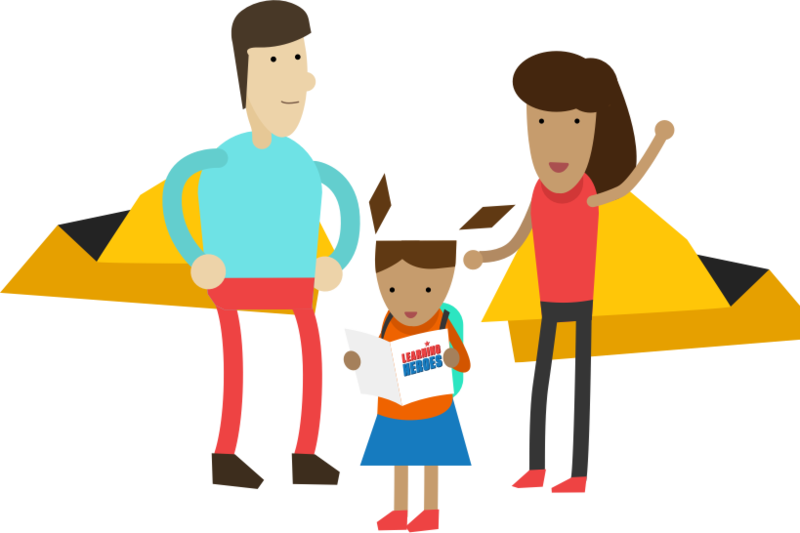 Since parents often don’t have time to scour the internet, we create tools like the Readiness Roadmap (www.bealearninghero.org/readiness-roadmap), where they can quickly and easily find their child’s learning goals, get grade-specific social and emotional resources, find good questions to ask at their next parent-teacher conference, and more, all in one place. How is Learning Heroes striving to reach more parents and schools who might benefit from your research and materials? Learning Heroes is honored to work with a variety of different types of partners, from parent and education organizations, to civil rights groups, media organizations, businesses, faith-based organizations, state departments of education, school districts, and more. Our partners are often the voices that parents know and trust. We continue to build and grow our partnerships at the national and local levels – and support their work with our research, exploring more effective ways of engaging even more parents and guardians. If your organization is interested in partnering with us, please reach out to Terrance Hamm at thamm@learningheroes.org and let us know what you’re working on.